A‎ generous portion of our hot creamy soup of the day served in a bread bowl. We suggest you finish part of the soup before eating the bowl. Start w/ crisp heads of romaine lettuce, shredded parmesan cheese, tossed w/ croutons & our house caesar dressing, topped w/ grilled chicken breast. Served w/ a slice of garlic bread. A freshly cut seasonal fruit selection served in a sundae glass & ringed w/ fresh orange slices. The cheese lover's sandwich. thick slices of Tillamook cheddar cheese melted between your choice of white or wheat bread & accompanied by kettle chips & a dill pickle. Sure to make a mouse or man take the bait. A‎ generous portion of lean sliced pastrami heaped upon your choice of a French roll or traditional rye bread. Mustard & sliced pickles complete the sandwich. Served w/ coleslaw & a dill pickle. Lean‎ sliced roast beef heated in au jus & served on a French roll. Served w/ cole slaw & a dill pickle, & of course, hot au jus for dipping. Breakfast served all day (or night). A delicious golden brown waffle made in the shape of the most famous mouse on earth. Served w/ butter & warm maple syrup. A plate of our delicious Ronzoni Healthy Harvest. Whole wheat blend spaghetti style pasta served w/ Rinaldi Tomato Sauce, tasty meatballs, & slice of crispy garlic toast. A generous portion of our chili w/ beans, shredded tillamook cheese, & onions on request. Served w/ sour cream & chives in an edible sourdough bowl. Pan‎ roasted turkey w/ swiss cheese, fresh roma tomatoes, crisp green lettuce, & yellow mustard. Served on freshly baked ciabatta bread, w/ choice of fresh fruit or kettle chips. White albacore tuna on a sourdough bread w/ lettuce & tomato. Served w/ choice of fresh fruit or kettle chips. Grilled chicken breast, fresh roma tomatoes, crisp romaine lettuce, mild cheddar cheese & a drizzle of buttermilk ranch dressing. Delicately wrapped in a honey wheat tortilla, w/ choice of fresh fruit or kettle chips. 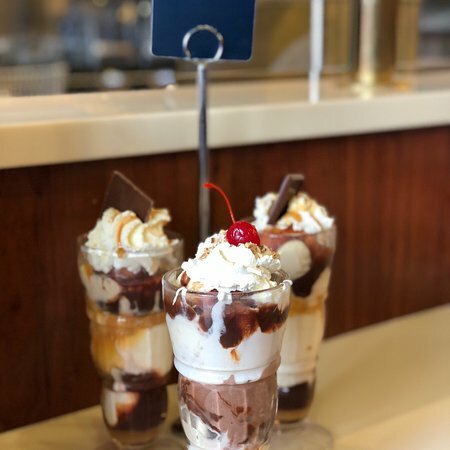 DC’s favorite & Dewar’s specialty – an amazing layered sundae! 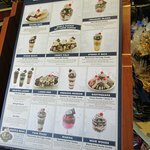 we start w/ a scoop of vanilla ice cream, topped w/ homemade hot fudge & then add a scoop of chocolate ice cream & scrumptious whipped marshmallow. If you’re nuts about this sundae add your choice of ground walnuts or almonds. Two large scoops of vanilla ice cream smothered w/ our homemade hot fudge & topped off w/ whipped cream, your choice of ground walnuts or almonds & a cherry. Two scoops of any flavor of ice cream. Add a sauce or syrup of your choice, one topping, whipped cream & a cherry. Two scoops of Dewar’s famous peppermint ice cream – made w/ real peppermint sticks – topped w/ rich marshmallow, hot fudge & some whipped cream on top. Our traditional banana split includes two scoops of vanilla ice cream & one scoop of chocolate ice cream. Top your vanilla ice cream w/ strawberry syrup & your chocolate ice cream w/ marshmallow & nuts. Inspired by the Sorcerer himself. Your choice of eight scoops of ice cream smothered in hot fudge, caramel & marshmallow. Topped w/ nuts & swirls of whipped cream, all served in a Sorcerer’s Apprentice dish. 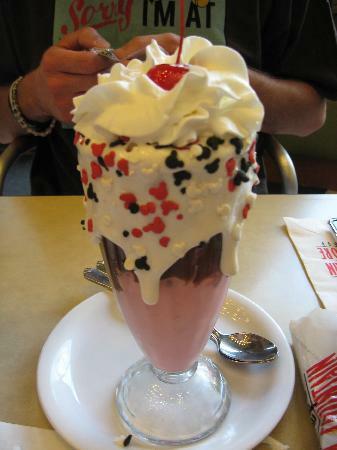 The perfect sundae to share w/ all your mouseketeers! Inspired by George Dewar himself. This shake blends vanilla ice cream, chocolate syrup, a fresh banana & a heaping teaspoon of ground walnuts. Have it thick or thin – you choose. 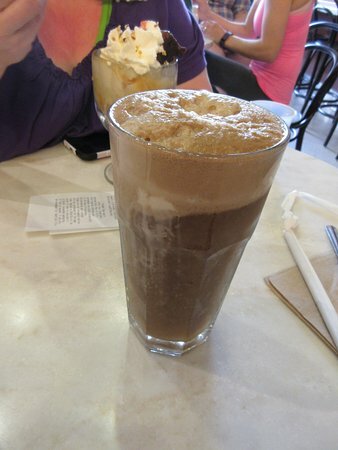 Our shakes & malts are made w/ two & one half large scoops of any flavor of ice cream & tasty syrup. We add real malt powder for the malts & mix it the old fashion way w/ real whole milk. Once you have had one you’ll be back for more! Select the ice cream of your choice & we’ll blend two & one half scoops of ice cream w/ carbonated water or your favorite fountain beverage to create this creamy refreshing treat. Just like mom used to make. One scoop of vanilla ice cream & your favorite fountain beverage. 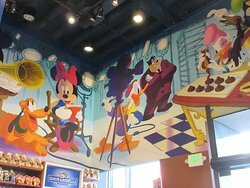 Disney + Chocolates = رائع! وبجوار مسرح إل كابيتان ، كان ذلك بمثابة غطاء جميل بعد مشاهدة فيلم. كان هناك الكثير من الشوكولاتة والحلويات الأخرى للاختيار من بينها. 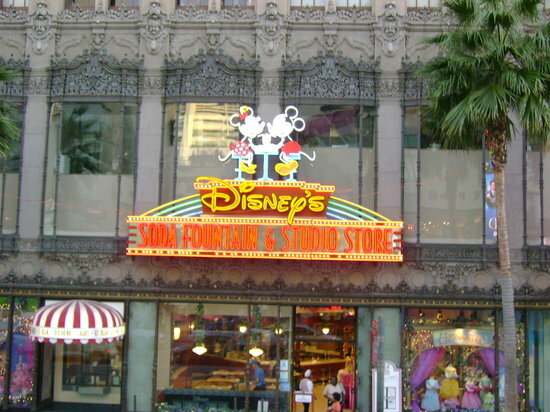 ديزني الشوكولاته على Hollywood Boulevard. 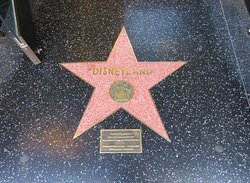 هذه هي أنظف من منطقة Hollywood Boulevard. جانب يمكنك أن ابني العم من أيوا دون القلق بشأن بإهانتهم لأى شخص. إن والآيس كريم واسعة حوض استحمام ساخن حلوى الفدج شهي. إلى حد ما متعة. 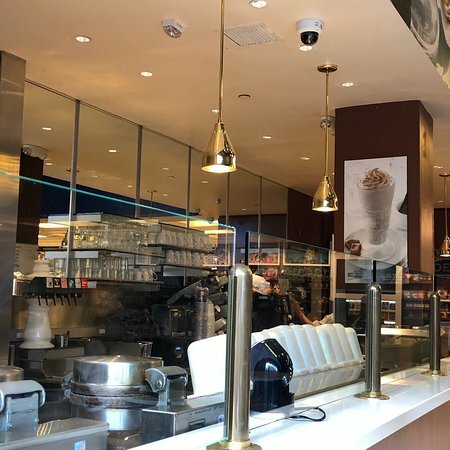 مجانية قطعة من Ghirardelli Chocolate فقط للسير في! حتى إذا لم يكن هناك شيء آخر، تأكد من أنك على بعد دقيقتين سيرا. سوف يكون، رحّب معاملة وشوكولا مجانية! يجب أن عند زيارة هوليوود. 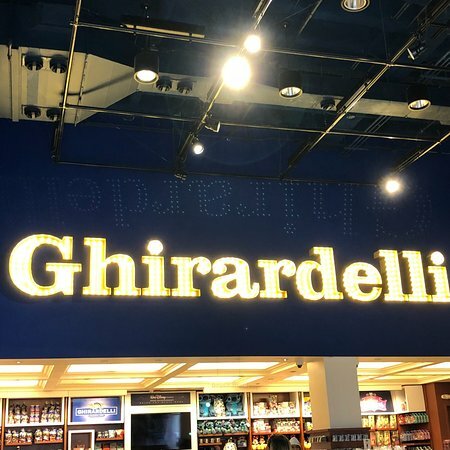 إن Ghirardelli Chocolate خارج هذا العالم، أوصي إلى وتخصصات الآيس كريم. مرح مع موقف مجاني طريفة و merch. 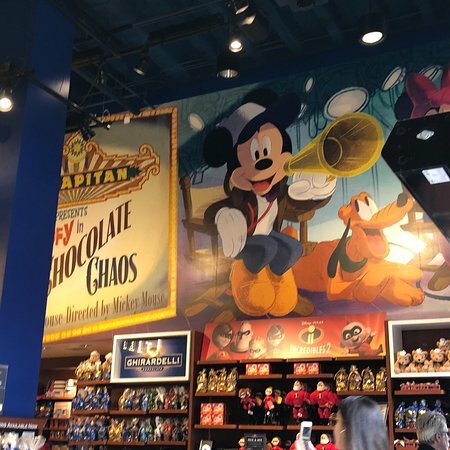 احصل على إجابات سريعة من موظفي ‪Disney Studio Store & Ghirardelli Soda Fountain‬ وزوار سابقين.